Water resources management increasingly requires compromise and consensus if solutions to problems are to be formulated and implemented. As issues of competing uses intensify, water decisionmakers are increasingly called upon to manage people as well as the water resource itself. Conflict can be defined as disagreement over the appropriate course of action to be taken in a particular situation. Conflict abounds as individuals and groups have different values , priorities, interests , and hopes for the future. Conflicts take place between neighbors, communities, states, regions, and nations. Areas of severe water conflict correlate with water scarcity; hence, the regions with the greatest conflict and potential for conflict are the Middle East, the Indian subcontinent, and the former Soviet Union. Water is a fugitive resource . As water moves through the hydrologic cycle , it does not pay any attention to political boundaries and conflicts that often result between differing political units. These types of conflicts are referred to as transboundary water issues. Conflicts also arise between different groups in society, such as business interests and environmental groups, or between parties located upstream and downstream. The ultimate conflict is armed conflict. Many fears have been expressed that water wars will occur in the future as water becomes more and more scarce. Historical studies have not supported this hypothesis that water disputes lead to war. There are only a couple of documented situations in all of history where war broke out over water. Although most water conflicts are nonviolent, they still have serious implications for societal welfare. Conflict can result from many factors. The sources of conflicts must be understood in order to manage water resources effectively. Three basic sources of conflict are conflicting goals, factual disagreements, and ineffective relationships (distrust and power struggles). Water planning and management activities are undertaken for the purpose of solving problems such as inadequate water supplies or poor water quality. For water planning efforts to be undertaken, the problem to be solved must be clearly identified and understood. Once a problem is identified, possible courses of action to address the problem can be enumerated and then the best course of action can be chosen and implemented. Conflicts over water often emerge when different groups of people have different goals. 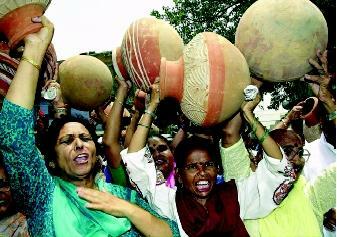 Here, New Delhi women carrying traditional water pots protest in May 2000 over an ongoing shortage of water and electricity in the Indian capital and surrounding areas. In reality, however, the preferred course of action to solve a problem depends on goals, values, and objectives. Goals are statements of a desired future situation, where stated goals then function as criteria for evaluating alternative courses of action. Thus, the process of goal-setting actually serves to influence the ultimate actions taken to achieve these goals. Goals are related to the decision-making participants' interests and values. Conflicting goals are common in water management scenarios. For example, dam-building is controversial around the world. Several large dam projects have engendered conflict with local peoples over the best ways to provide water supplies, protect the environment, and the rights of relocated groups to their homes. These conflicts are local, but have also attracted international attention from environmental and human rights groups. These groups work together in order to influence the local government to stop building the dam, and to persuade the banks to eliminate loan money to fund the dam. These types of conflicts over dam-building are currently seen in India, Turkey, China, and many other countries needing to meet the rising water demands of their large populations. The clashing desires to achieve different goals lead to much conflict in the water management process. In the example above, the conflict is between the goals of water supply and hydropower versus the goals of social and environmental preservation. In such instances, it is difficult to resolve conflicting goals. In these cases, the parties may agree on the effects of certain actions but disagree on the desirability of these effects, and therefore fundamentally disagree on the desirability of the action itself. Thus, goal-setting is an important water management activity requiring the participation of all relevant stakeholders . Sometimes, differences over the preferred course of action to solve water problems stem from disagreements over the facts, or perceived facts, of the situation. These disagreements are often genuine differences of opinion, and can be related to the poor quality of information or to a lack of data. For example, in the previous example of dam-building, factual disagreements may arise over the exact sediment load of the river, the actual need for additional water supplies, the ability to finance the project, or the legal rights the local people have according to national laws. In practice, facts are rarely clear-cut pieces of information; on the contrary, they often are infused with information stemming from individual or group values and interests. Several factors can lead to factual disagreements. First, facts are rarely completely certain and their degree of uncertainty can influence how much conflict may result. This uncertainty exists because human knowledge is incomplete or imperfect. Furthermore, there are limitations to science and scientific methods. For example, people may not completely understand how contaminants travel through a specific groundwater system, nor how water is actually used in a given locality. Often assumptions are substituted for agreed-upon facts. This lack of information constrains decision-making processes and opens up room for parties to debate the facts utilized in decision-making. Second, factual disagreements can stem from the situation in which the parties have different information. Many times, parties rely on completely different sets of information for their decision-making, and may not share or discuss the information with the conflicting party. For example, hydropower providers tend to look at the quantity, cost, and profit level of power to potentially be generated. Yet local environmental groups tend to look at the state of water systems, and threats to those systems. Each group has its own network from which they collect information. Sometimes groups may even exaggerate factual disagreements to achieve their own desired goals in the decision-making process. Third, factual disagreements can arise from limitations of parties' abilities to process information. Many water management problems are very complex. Psychological research often shows that both the expert and average citizen can use only a few pieces of information when drawing conclusions in decision-making. Which pieces are actually used and the weight attached to them differs widely from individual to individual. And sometimes, people are not consistent in decision-making. All these factors help explain many seemingly factual disagreements between parties in water management processes. The third source of conflict stems from the state of the ongoing relationship between the disagreeing parties, particularly issues of distrust and power struggles. A situation of distrust breeds conflict, as parties have no foundation for communication and collaborative problem-solving activities. Distrust is often the result of poor communication and can often lead to further misunderstandings. These tensions often cause parties to be less willing or even unwilling to cooperate with each other. Sometimes distrust is the result of personality conflicts or historical circumstances. Power struggles are related to distrust and take the form of competition over various sources of power related to the decision-making process, such as financial resources, access to the media, and access to information. Parties are struggling for power rather than attending to solving the water problem at hand. 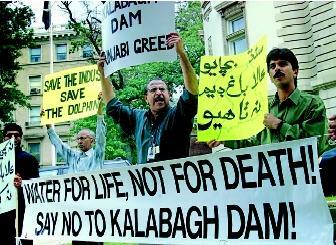 Protestors in front of the Pakistan embassy in Washington, D.C. in 2000 wave placards against the proposed Kalabagh Dam on the Indus River. Their concerns included the displacement of people, environmental impacts, and the ultimate distribution of water. The Pakistani government was compelled to cancel its construction plans because of these stakeholder conflicts. It is difficult to resolve power struggles, and parties often find themselves locked into these types of conflicts. Sometimes these parties will refuse to accept workable solutions because the power struggle becomes more important than solving the actual problem, and they might be perceived as weak for accepting a compromise. These relationship-based factors among the stakeholders can generate conflict in water management scenarios. More than one source of conflict may be present in any water management situation. Due to these prevalent sources of conflict, conflict resolution is an essential component of current water management activities around the world. Many conflicts are taken to court systems where they can be costly to resolve, in terms of both time and money. Some disputes are repeatedly taken to the courts and thus are never truly resolved. Resolving conflict requires compromise. And compromise often involves (1) a willingness to accept the validity of another party to hold a different perspective; (2) an attempt to understand other perspectives even when those perspectives are not accepted; and (3) a search for solutions that will accommodate diverse interests. In the past, water management issues were often viewed as technical problems that could be "cured" by structural solutions such as reservoirs, dams, and levees. Satisfying water demands was the primary goal. But today, water resources are increasingly scarce, populations have grown, and water management is much more complex. Financial considerations have grown in importance, given society's tight budgets and the major expenses of water-related infrastructure. Environmental considerations are more prominent with greater societal awareness and concern for detrimental impacts to the environment. All of these factors have increased the potential for conflict in water management activities. Hence, conflict resolution techniques have grown in importance as water managers increasingly are called upon to resolve conflicts. Methods that water managers can use to resolve specific types of conflict include the following. These types of solutions can be valuable in resolving conflict and promoting effective long-term answers to water problems. Conflict is not necessarily a bad or undesirable thing, and it often presents an opportunity for much-needed dialogue. Conflict can also help identify where things need to be done better. The challenge for water managers is to ensure that conflict is a constructive force in decision-making processes and that it does not become destructive. Ignoring conflict can lead to greater conflict in the future and thus impairs the implementation of potential solutions to water-related problems. Water managers must effectively deal with conflict if water management is to be successful and benefit society. SEE ALSO Hydropolitics ; International Cooperation ; Law, Water ; Planning and Management, Water Resources ; Transboundary Water Treaties ; Uses of Water . Mitchell, Bruce. Resource and Environmental Management. Essex, U.K.: Addison Wesley Longman Limited, 1997. Conflict Prevention and Resolution Center. U.S. Environmental Protection Agency. <http://www.epa.gov/adr/> . CRInfo: Conflict Resolution Information Source. University of Colorado at Boulder. <http://www.Colorado.edu/conflict/> . Mediation Information and Resource Center. Resourceful Internet Solutions, Inc. <http://www.mediate.com/> . Resolve. Center for Environmental and Public Policy Dispute Resolution. <http://www.resolv.org/> . Wolf, Aaron T. Transboundary Freshwater Dispute Database. Department of Geosciences, Oregon State University. <http://www.transboundarywaters.orst.edu> . Alternative dispute resolution (ADR) emerged in response to perceived problems relating to resolving all conflicts in the court system. ADR approaches try to avoid the adversarial nature of the legal system's winner-loser outcomes and try to promote win-win solutions. There are several different types of ADR. Under alternative dispute resolution processes involving mediation, the parties in conflict come together along with a mediator to find ways to resolve their conflict. The mediator is a trained, neutral third party who has no stake in the outcome of the process. The mediator enables the parties to discuss their interests, listen to the other parties, and understand the facts and the areas of common ground where win-win type solutions may be built. The parties in conflict have no obligation to abide by the outcomes of the mediation, unless it is a process called binding arbitration.